This is my third and final comments on Feynman’s popular little booklet: The Strange Theory of Light and Matter, also known as Feynman’s Lectures on Quantum Electrodynamics (QED). Alix Mautner died from a brain tumor, and it is her husband, Leonard Mautner, who sponsored the QED lectures series at the UCLA, which Ralph Leigton transcribed and published as the booklet that we’re talking about here. Feynman himself died a few years later, at the relatively young age of 69. Tragic coincidence: he died of cancer too. Despite all this weirdness, Feynman’s QED never quite got the same iconic status of, let’s say, Stephen Hawking’s Brief History of Time. I wonder why, but the answer to that question is probably in the realm of chaos theory. 🙂 I actually just saw the movie on Stephen Hawking’s life (The Theory of Everything), and I noted another strange coincidence: Jane Wilde, Hawking’s first wife, also has a PhD in literature. It strikes me that, while the movie documents that Jane Wilde gave Hawking three children, after which he divorced her to marry his nurse, Elaine, the movie does not mention that he separated from Elaine too, and that he has some kind of ‘working relationship’ with Jane again. Hmm… What to say? I should get back to quantum mechanics here or, to be precise, to quantum electrodynamics. One reason why Feynman’s Strange Theory of Light and Matter did not sell like Hawking’s Brief History of Time, might well be that, in some places, the text is not entirely accurate. Why? Who knows? It would make for an interesting PhD thesis in History of Science. Unfortunately, I have no time for such PhD thesis. Hence, I must assume that Richard Feynman simply didn’t have much time or energy left to correct some of the writing of Ralph Leighton, who transcribed and edited these four short lectures a few years before Feynman’s death. Indeed, when everything is said and done, Ralph Leighton is not a physicist and, hence, I think he did compromise – just a little bit – on accuracy for the sake of readability. Ralph Leighton’s father, Robert Leighton, an eminent physicist who worked with Feynman, would probably have done a much better job. I feel that one should not compromise on accuracy, even when trying to write something reader-friendly. That’s why I am writing this blog, and why I am writing three posts specifically on this little booklet. Indeed, while I’d warmly recommend that little book on QED as an excellent non-mathematical introduction to the weird world of quantum mechanics, I’d also say that, while Ralph Leighton’s story is great, it’s also, in some places, not entirely accurate indeed. So… Well… I want to do better than Ralph Leighton here. Nothing more. Nothing less. 🙂 Let’s go for it. I. Probability amplitudes: what are they? The greatest achievement of that little QED publication is that it manages to avoid any reference to wave functions and other complicated mathematical constructs: all of the complexity of quantum mechanics is reduced to three basic events or actions and, hence, three basic amplitudes which are represented as ‘arrows’—literally. Now… Well… You may or may not know that a (probability) amplitude is actually a complex number, but it’s not so easy to intuitively understand the concept of a complex number. In contrast, everyone easily ‘gets’ the concept of an ‘arrow’. Hence, from a pedagogical point of view, representing complex numbers by some ‘arrow’ is truly a stroke of genius. Whatever we call it, a complex number or an ‘arrow’, a probability amplitude is something with (a) a magnitude and (b) a phase. As such, it resembles a vector, but it’s not quite the same, if only because we’ll impose some restrictions on the magnitude. But I shouldn’t get ahead of myself. Let’s start with the basics. A magnitude is some real positive number, like a length, but you should not associate it with some spatial dimension in physical space: it’s just a number. As for the phase, we could associate that concept with some direction but, again, you should just think of it as a direction in a mathematical space, not in the real (physical) space. End of digression. Let’s discuss these two mathematical concepts – magnitude and phase – somewhat more in detail. Let’s start with the magnitude or ‘length’ of our arrow. We know that we have to square these lengths to find some probability, i.e. some real number between 0 and 1. Hence, the length of our arrows cannot be larger than one. That’s the restriction I mentioned already, and this ‘normalization’ condition reinforces the point that these ‘arrows’ do not have any spatial dimension (not in any real space anyway): they represent a function. To be specific, they represent a wavefunction. If we’d be talking complex numbers instead of ‘arrows’, we’d say the absolute value of the complex number cannot be larger than one. We’d also say that, to find the probability, we should take the absolute square of the complex number, so that’s the square of the magnitude or absolute value of the complex number indeed. We cannot just square the complex number: it has to be the square of the absolute value. Why? Well… Just write it out. [You can skip this section if you’re not interested in complex numbers, but I would recommend you try to understand. It’s not that difficult. Indeed, if you’re reading this, you’re most likely to understand something of complex numbers and, hence, you should be able to work your way through it. Just remember that a complex number is like a two-dimensional number, which is why it’s sometimes written using bold-face (z), rather than regular font (z). However, I should immediately add this convention is usually not followed. I like the boldface though, and so I’ll try to use it in this post.] The square of a complex number z = a + bi is equal to z2 = a2 + 2abi – b2, while the square of its absolute value (i.e. the absolute square) is |z|2 = [√(a2 + b2)]2 = a2 + b2. So you can immediately see that the square and the absolute square of a complex numbers are two very different things indeed: it’s not only the 2abi term, but there’s also the minus sign in the first expression, because of the i2 = –1 factor. In case of doubt, always remember that the square of a complex number may actually yield a negative number, as evidenced by the definition of the imaginary unit itself: i2 = –1. End of digression. Feynman and Leighton manage to avoid any reference to complex numbers in that short series of four lectures and, hence, all they need to do is explain how one squares a length. Kids learn how to do that when making a square out of rectangular paper: they’ll fold one corner of the paper until it meets the opposite edge, forming a triangle first. They’ll then cut or tear off the extra paper, and then unfold. Done. [I could note that the folding is a 90 degree rotation of the original length (or width, I should say) which, in mathematical terms, is equivalent to multiplying that length with the imaginary unit (i). But I am sure the kids involved would think I am crazy if I’d say this. 🙂 So let me get back to Feynman’s arrows. Feynman and Leighton’s second pedagogical stroke of genius is the metaphor of the ‘stopwatch’ and the ‘stopwatch hand’ for the variable phase. Indeed, although I think it’s worth explaining why z = a + bi = rcosφ + irsinφ in the illustration below can be written as z = reiφ = |z|eiφ, understanding Euler’s representation of complex number as a complex exponential requires swallowing a very substantial piece of math and, if you’d want to do that, I’ll refer you to one of my posts on complex numbers). The metaphor of the stopwatch represents a periodic function. To be precise, it represents a sinusoid, i.e. a smooth repetitive oscillation. Now, the stopwatch hand represents the phase of that function, i.e. the φ angle in the illustration above. That angle is a function of time: the speed with which the stopwatch turns is related to some frequency, i.e. the number of oscillations per unit of time (i.e. per second). For photons, the frequency is given by Planck’s energy-frequency relation, which relates the energy (E) of a photon (1.5 to 3.5 eV for visible light) to its frequency (ν). It’s a simple proportional relation, with Planck’s constant (h) as the proportionality constant: E = hν, or ν = E/h. For electrons, we have the de Broglie relation, which looks similar to the Planck relation (E = hf, or f = E/h) but, as you know, it’s something different. Indeed, these so-called matter waves are not so easy to interpret because there actually is no precise frequency f. In fact, the matter wave representing some particle in space will consist of a potentially infinite number of waves, all superimposed one over another, as illustrated below. For the sake of accuracy, I should mention that the animation above has its limitations: the wavetrain is complex-valued and, hence, has a real as well as an imaginary part, so it’s something like the blob underneath. Two functions in one, so to speak: the imaginary part follows the real part with a phase difference of 90 degrees (or π/2 radians). Indeed, if the wavefunction is a regular complex exponential reiθ, then rsin(φ–π/2) = rcos(φ), which proves the point: we have two functions in one here. 🙂 I am actually just repeating what I said before already: the probability amplitude, or the wavefunction, is a complex number. You’ll usually see it written as Ψ (psi) or Φ (phi). Here also, using boldface (Ψ or Φ instead of Ψ or Φ) would usefully remind the reader that we’re talking something ‘two-dimensional’ (in mathematical space, that is), but this convention is usually not followed. In any case… Back to frequencies. The point to note is that, when it comes to analyzing electrons (or any other matter-particle), we’re dealing with a range of frequencies f really (or, what amounts to the same, a range of wavelengths λ) and, hence, we should write Δf = ΔE/h, which is just one of the many expressions of the Uncertainty Principle in quantum mechanics. Now, that’s just one of the complications. Another difficulty is that matter-particles, such as electrons, have some rest mass, and so that enters the energy equation as well (literally). Last but not least, one should distinguish between the group velocity and the phase velocity of matter waves. As you can imagine, that makes for a very complicated relationship between ‘the’ wavelength and ‘the’ frequency. In fact, what I write above should make it abundantly clear that there’s no such thing as the wavelength, or the frequency: it’s a range really, related to the fundamental uncertainty in quantum physics. I’ll come back to that, and so you shouldn’t worry about it here. Just note that the stopwatch metaphor doesn’t work very well for an electron! In his postmortem lectures for Alix Mautner, Feynman avoids all these complications. Frankly, I think that’s a missed opportunity because I do not think it’s all that incomprehensible. In fact, I write all that follows because I do want you to understand the basics of waves. It’s not difficult. High-school math is enough here. Let’s go for it. One turn of the stopwatch corresponds to one cycle. One cycle, or 1 Hz (i.e. one oscillation per second) covers 360 degrees or, to use a more natural unit, 2π radians. [Why is radian a more natural unit? Because it measures an angle in terms of the distance unit itself, rather than in arbitrary 1/360 cuts of a full circle. Indeed, remember that the circumference of the unit circle is 2π.] So our frequency ν (expressed in cycles per second) corresponds to a so-called angular frequency ω = 2πν. From this formula, it should be obvious that ω is measured in radians per second. The easy math above now allows us to formally write the phase of a wavefunction – let’s denote the wavefunction as φ (phi), and the phase as θ (theta) – as a function of time (t) using the angular frequency ω. So we can write: θ = ωt = 2π·ν·t. Now, the wave travels through space, and the two illustrations above (i.e. the one with the super-imposed waves, and the one with the complex wave train) would usually represent a wave shape at some fixed point in time. Hence, the horizontal axis is not t but x. Hence, we can and should write the phase not only as a function of time but also of space. So how do we do that? Well… If the hypothesis is that the wave travels through space at some fixed speed c, then its frequency ν will also determine its wavelength λ. It’s a simple relationship: c = λν (the number of oscillations per second times the length of one wavelength should give you the distance traveled per second, so that’s, effectively, the wave’s speed). Now that we’ve expressed the frequency in radians per second, we can also express the wavelength in radians per unit distance too. That’s what the wavenumber does: think of it as the spatial frequency of the wave. We denote the wavenumber by k, and write: k = 2π/λ. [Just do a numerical example when you have difficulty following. For example, if you’d assume the wavelength is 5 units distance (i.e. 5 meter) – that’s a typical VHF radio frequency: ν = (3×108 m/s)/(5 m) = 0.6×108 Hz = 60 MHz – then that would correspond to (2π radians)/(5 m) ≈ 1.2566 radians per meter. Of course, we can also express the wave number in oscillations per unit distance. In that case, we’d have to divide k by 2π, because one cycle corresponds to 2π radians. So we get the reciprocal of the wavelength: 1/λ. In our example, 1/λ is, of course, 1/5 = 0.2, so that’s a fifth of a full cycle. You can also think of it as the number of waves (or wavelengths) per meter: if the wavelength is λ, then one can fit 1/λ waves in a meter. Note that, if the wave would be traveling in the ‘other’ direction (i.e. in the negative x-direction), we’d write φ(θ) = φ[kx+ωt]. Time travels in one direction only, of course, but so one minus sign has to be there because of the logic involved in adding time and subtracting distance. You can work out an example (with a sine or cosine wave, for example) for yourself. So what, you’ll say? Well… Nothing. I just hope you agree that all of this isn’t rocket science: it’s just high-school math. But so it shows you what that stopwatch really is and, hence, I – but who am I? – would have put at least one or two footnotes on this in a text like Feynman’s QED. As you can see from the argument (or phase) of that wave function φ(θ) = φ[θ(x, t)] = φ[ωt–kx] = φ[–k(x–ct)], any wave equation establishes a deep relation between the wave itself (i.e. the ‘thing’ we’re describing) and space and time. In fact, that’s what the whole wave equation is all about! So let me say a few things more about that. Because you know a thing or two about physics, you may ask: when we’re talking time, whose time are we talking about? Indeed, if we’re talking photons going from A to B, these photons will be traveling at or near the speed of light and, hence, their clock, as seen from our (inertial) frame of reference, doesn’t move. Likewise, according to the photon, our clock seems to be standing still. Let me put the issue to bed immediately: we’re looking at things from our point of view. Hence, we’re obviously using our clock, not theirs. Having said that, the analysis is actually fully consistent with relativity theory. Why? Well… What do you expect? If it wasn’t, the analysis would obviously not be valid. 🙂 To illustrate that it’s consistent with relativity theory, I can mention, for example, that the (probability) amplitude for a photon to travel from point A to B depends on the spacetime interval, which is invariant. Hence, A and B are four-dimensional points in spacetime, involving both spatial as well as time coordinates: A = (xA, yA, zA, tA) and B = (xB, yB, zB, tB). And so the ‘distance’ – as measured through the spacetime interval – is invariant. Let me make another small digression within the digression here. Thinking about travel at the speed of light invariably leads to paradoxes. In previous posts, I explained the mechanism of light emission: a photon is emitted – one photon only – when an electron jumps back to its ground state after being excited. Hence, we may imagine a photon as a transient electromagnetic wave–something like what’s pictured below. Now, the decay time of this transient oscillation (τ) is measured in nanoseconds, i.e. billionths of a second (1 ns = 1×10–9 s): the decay time for sodium light, for example, is some 30 ns only. However, because of the tremendous speed of light, that still makes for a wavetrain that’s like ten meter long, at least (30×10–9 s times 3×108 m/s is nine meter, but you should note that the decay time measures the time for the oscillation to die out by a factor 1/e, so the oscillation itself lasts longer than that). Those nine or ten meters cover like 16 to 17 million oscillations (the wavelength of sodium light is about 600 nm and, hence, 10 meter fits almost 17 million oscillations indeed). Now, how can we reconcile the image of a photon as a ten-meter long wavetrain with the image of a photon as a point particle? The answer to that question is paradoxical: from our perspective, anything traveling at the speed of light – including this nine or ten meter ‘long’ photon – will have zero length because of the relativistic length contraction effect. Length contraction? Yes. I’ll let you look it up, because… Well… It’s not easy to grasp. Indeed, from the three measurable effects on objects moving at relativistic speeds – i.e. (1) an increase of the mass (the energy needed to further accelerate particles in particle accelerators increases dramatically at speeds nearer to c), (2) time dilation, i.e. a slowing down of the (internal) clock (because of their relativistic speeds when entering the Earth’s atmosphere, the measured half-life of muons is five times that when at rest), and (3) length contraction – length contraction is probably the most paradoxical of all. Let me end this digression with yet another short note. I said that one will always measure the speed of light c as being equal to 299,792,458 m/s, always and everywhere and, hence, that it does not depend on your reference frame (inertial or moving). Well… That’s true and not true at the same time. I actually need to nuance that statement a bit in light of what follows: an individual photon does have an amplitude to travel faster or slower than c, and when discussing matter waves (such as the wavefunction that’s associated with an electron), we can have phase velocities that are faster than light! However, when calculating those amplitudes, c is a constant. That doesn’t make sense, you’ll say. Well… What can I say? That’s how it is unfortunately. I need to move on and, hence, I’ll end this digression and get back to the main story line. Part I explained what probability amplitudes are—or at least tried to do so. Now it’s time for part II: the building blocks of all of quantum electrodynamics (QED). P(A to B) is the (probability) amplitude for a photon to travel from point A to B. However, I should immediately note that A and B are points in spacetime. Therefore, we associate them not only with some specific (x, y, z) position in space, but also with a some specific time t. Now, quantum-mechanical theory gives us an easy formula for P(A to B): it depends on the so-called (spacetime) interval between the two points A and B, i.e. I = Δr2 – Δt2 = (x2–x1)2+(y2–y1)2+(z2–z1)2 – (t2–t1)2. The point to note is that the spacetime interval takes both the distance in space as well as the ‘distance’ in time into account. As I mentioned already, this spacetime interval does not depend on our reference frame and, hence, it’s invariant (as long as we’re talking reference frames that move with constant speed relative to each other). Also note that we should measure time and distance in equivalent units when using that Δr2 – Δt2 formula for I. So we either measure distance in light-seconds or, else, we measure time in units that correspond to the time that’s needed for light to travel one meter. If no equivalent units are adopted, the formula is I = Δr2 – c·Δt2. Now, in quantum theory, anything is possible and, hence, not only do we allow for crooked paths, but we also allow for the difference in time to differ from the time you’d expect a photon to need to travel along some curve (whose length we’ll denote by l), i.e. l/c. Hence, our photon may actually travel slower or faster than the speed of light c! There is one lucky break, however, that makes all come out alright: it’s easy to show that the amplitudes associated with the odd paths and strange timings generally cancel each other out. [That’s what the QED booklet shows.] Hence, what remains, are the paths that are equal or, importantly, those that very near to the so-called ‘light-like’ intervals in spacetime only. The net result is that light – even one single photon – effectively uses a (very) small core of space as it travels, as evidenced by the fact that even one single photon interferes with itself when traveling through a slit or a small hole! E(A to B) is the (probability) amplitude for an electron to travel from point A to B. The formula for E(A to B) is much more complicated, and it’s the one I want to discuss somewhat more in detail in this post. It depends on some complex number j (see the next remark) and some real number n.
Finally, an electron could emit or absorb a photon, and the amplitude associated with this event is denoted by j, for junction number. It’s the same number j as the one mentioned when discussing E(A to B) above. Now, this junction number is often referred to as the coupling constant or the fine-structure constant. However, the truth is, as I pointed out in my previous post, that these numbers are related, but they are not quite the same: α is the square of j, so we have α = j2. There is also one more, related, number: the gauge parameter, which is denoted by g (despite the g notation, it has nothing to do with gravitation). The value of g is the square root of 4πε0α, so g2 = 4πε0α. I’ll come back to this. Let me first make an awfully long digression on the fine-structure constant. It will be awfully long. So long that it’s actually part of the ‘core’ of this post actually. The value for j is approximately –0.08542454. Why? Well… For starters, when doing all those quantum-mechanical calculations, we like to think of j as a dimensionless number: a coupling constant. But so here we do have a dimension: electric charge. That’s a pretty impressive collection of physical constants, isn’t it? 🙂 They’re all different but, somehow, when we combine them in one or the other ratio (we have not less than five different expressions here (each identity is a separate expression), and I could give you a few more! ), we get the very same number: α. Now that is what I call strange. Truly strange. Incomprehensibly weird! You’ll say… Well… Those constants must all be related… Of course! That’s exactly the point I am making here. They are, but look how different they are: me measures mass, re measures distance, e is a charge, and so these are all very different numbers with very different dimensions. Yet, somehow, they are all related through this α number. Frankly, I do not know of any other expression that better illustrates some kind of underlying unity in Nature than the one with those five identities above. The ke constant is the Coulomb constant and, from its definition ke = 1/4πε0, it’s easy to see how those two expressions are, in turn, equivalent with the third expression for α. The RK constant is the so-called von Klitzing constant. Huh? Yes. I know. I am pretty sure you’ve never ever heard of that one before. Don’t worry about it. It’s, quite simply, equal to RK = h/e2. Hence, substituting (and don’t forget that h = 2πħ) will demonstrate the equivalence of the fourth expression for α. Finally, the re factor is the classical electron radius, which is usually written as a function of me, i.e. the electron mass: re = e2/4πε0mec2. Also note that this also implies that reme = e2/4πε0c2. In words: the product of the electron mass and the electron radius is equal to some constant involving the electron (e), the electric constant (ε0), and c (the speed of light). I am sure you’re under some kind of ‘formula shock’ now. But you should just take a deep breath and read on. The point to note is that all these very different things are all related through α.
Well… Let me start by explaining the term itself. The fine structure in the name refers to the splitting of the spectral lines of atoms. That’s a very fine structure indeed. 🙂 We also have a so-called hyperfine structure. Both are illustrated below for the hydrogen atom. 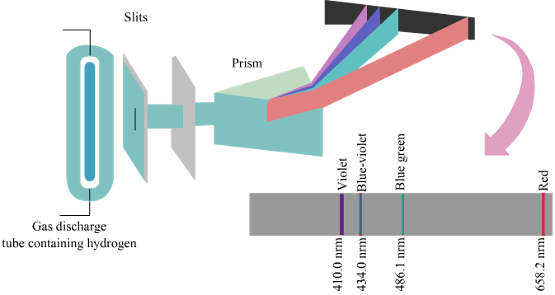 The numbers n, J, I, and F are quantum numbers used in the quantum-mechanical explanation of the emission spectrum, which is also depicted below, but note that the illustration gives you the so-called Balmer series only, i.e. the colors in the visible light spectrum (there are many more ‘colors’ in the high-energy ultraviolet and the low-energy infrared range). To be precise: (1) n is the principal quantum number: here it takes the values 1 or 2, and we could say these are the principal shells; (2) the S, P, D,… orbitals (which are usually written in lower case: s, p, d, f, g, h and i) correspond to the (orbital) angular momentum quantum number l = 0, 1, 2,…, so we could say it’s the subshell; (3) the J values correspond to the so-called magnetic quantum number m, which goes from –l to +l; (4) the fourth quantum number is the spin angular momentum s. I’ve copied another diagram below so you see how it works, more or less, that is. Now, our fine-structure constant is related to these quantum numbers. How exactly is a bit of a long story, and so I’ll just copy Wikipedia’s summary on this: ” The gross structure of line spectra is the line spectra predicted by the quantum mechanics of non-relativistic electrons with no spin. For a hydrogenic atom, the gross structure energy levels only depend on the principal quantum number n. However, a more accurate model takes into account relativistic and spin effects, which break the degeneracy of the the energy levels and split the spectral lines. The scale of the fine structure splitting relative to the gross structure energies is on the order of (Zα)2, where Z is the atomic number and α is the fine-structure constant.” There you go. You’ll say: so what? Well… Nothing. If you aren’t amazed by that, you should stop reading this. The point is: α is not the only weird number. What’s particular about it, as a physical constant, is that it’s dimensionless, because it relates a number of other physical constants in such a way that the units fall away. Having said that, the Planck or Boltzmann constant are at least as weird. So… What is this all about? Well… You’ve probably heard about the so-called fine-tuning problem in physics and, if you’re like me, your first reaction will be to associate fine-tuning with fine-structure. However, the two terms have nothing in common, except for four letters. 🙂 OK. Well… I am exaggerating here. The two terms are actually related, to some extent at least, but let me explain how. The term fine-tuning refers to the fact that all the parameters or constants in the so-called Standard Model of physics are, indeed, all related to each other in the way they are. We can’t sort of just turn the knob of one and change it, because everything falls apart then. So, in essence, the fine-tuning problem in physics is more like a philosophical question: why is the value of all these physical constants and parameters exactly what it is? So it’s like asking: could we change some of the ‘constants’ and still end up with the world we’re living in? Or, if it would be some different world, how would it look like? What if c was some other number? What if ke or ε0 was some other number? In short, and in light of those expressions for α, we may rephrase the question as: why is α what is is? Of course, that’s a question one shouldn’t try to answer before answering some other, more fundamental, question: how many degrees of freedom are there really? Indeed, we just saw that ke and ε0 are intimately related through some equation, and other constants and parameters are related too. So the question is like: what are the ‘dependent’ and the ‘independent’ variables in this so-called Standard Model? There is no easy answer to that question. In fact, one of the reasons why I find physics so fascinating is that one cannot easily answer such questions. There are the obvious relationships, of course. For example, the ke = 1/4πε0 relationship, and the context in which they are used (Coulomb’s Law) does, indeed, strongly suggest that both constants are actually part and parcel of the same thing. Identical, I’d say. Likewise, the μ0ε0 = 1/c2 relation also suggests there’s only one degree of freedom here, just like there’s only one degree of freedom in that ω/k = c relationship (if we set a value for ω, we have k, and vice versa). But… Well… I am not quite sure how to phrase this, but… What physical constants could be ‘variables’ indeed? It’s pretty obvious that the various formulas for α cannot answer that question: you could stare at them for days and weeks and months and years really, but I’d suggest you use your time to read more of Feynman’s real Lectures instead. 🙂 One point that may help to come to terms with this question – to some extent, at least – is what I casually mentioned above already: the fine-structure constant is equal to the square of the electron charge expressed in Planck units: α = eP2. Now, that’s very remarkable because Planck units are some kind of ‘natural units’ indeed (for the detail, see my previous post: among other things, it explains what these Planck units really are) and, therefore, it is quite tempting to think that we’ve actually got only one degree of freedom here: α itself. All the rest should follow from it. It should… But… Does it? We also have some some real number n in the E(A to B) formula. So what’s the n? Well… Believe it or not, it’s the electron mass! Isn’t that amazing? You’ll say: “Well… Hmm… I suppose so.” But then you may – and actually should – also wonder: the electron mass? In what units? Planck units again? And are we talking relativistic mass (i.e. its total mass, including the equivalent mass of its kinetic energy) or its rest mass only? And we were talking α here, so can we relate it to α too, just like the electron charge? These are all very good questions. Let’s start with the second one. We’re talking rather slow-moving electrons here, so the relativistic mass (m) and its rest mass (m0) is more or less the same. Indeed, the Lorentz factor γ in the m = γm0 equation is very close to 1 for electrons moving at their typical speed. So… Well… That question doesn’t matter very much. Really? Yes. OK. Because you’re doubting, I’ll quickly show it to you. What is their ‘typical’ speed? Now we also know its kinetic energy (K.E.) is mv2/2, which we can write as p2/2m. Substituting our p ≈ ħ/r conjecture, we get K.E. = mv2/2 = ħ2/2mr2. This is equivalent to m2v2 = ħ2/r2 (just multiply both sides with m). From that, we get v = ħ/mr. Now, one of the many relations we can derive from the formulas for the fine-structure constant is re = α2r. [I haven’t showed you that yet, but I will shortly. It’s a really amazing expression. However, as for now, just accept it as a simple formula for interim use in this digression.] Hence, r = re/α2. The re factor in this expression is the so-called classical electron radius. So we can now write v = ħα2/mre. Let’s now throw c in: v/c = α2ħ/mcre. However, from that fifth expression for α, we know that ħ/mcre = α, so we get v/c = α. We have another amazing result here: the v/c ratio for an electron (i.e. its speed expressed as a fraction of the speed of light) is equal to that fine-structure constant α. So that’s about 1/137, so that’s less than 1% of the speed of light. Now… I’ll leave it to you to calculate the Lorentz factor γ but… Well… It’s obvious that it will be very close to 1. 🙂 Hence, the electron’s speed – however we want to visualize that – doesn’t matter much indeed, so we should not worry about relativistic corrections in the formulas. Measured in our old-fashioned super-sized SI kilogram unit, the electron mass is me = 9.1×10–31 kg. The Planck mass is mP = 2.1765×10−8 kg. Hence, the electron mass expressed in Planck units is meP = me/mP = (9.1×10–31 kg)/(2.1765×10−8 kg) = 4.181×10−23. So… Well… Yes: yet another amazing formula involving α. In this formula, we have reP and rP, which are the (classical) electron radius and the Bohr radius expressed in Planck (length) units respectively. So you can see what’s going on here: we have all kinds of numbers here expressed in Planck units: a charge, a radius, a mass,… And we can relate all of them to the fine-structure constant. Yes. They’re dimensionless because they measure something in natural units, i.e. Planck units, and, hence, that’s some kind of relative measure indeed so… Well… Yes, dimensionless. No. 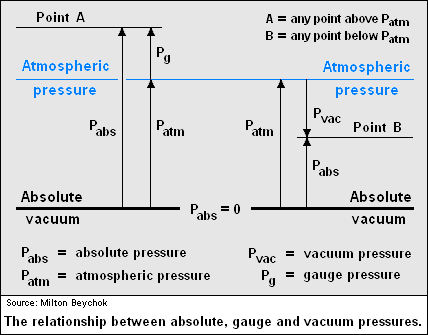 They’re not dimensionless because they do measure something, like a charge, a length, or a mass, and when you chose some kind of relative measure, you still need to define some gauge, i.e. some kind of standard measure. So there’s some ‘dimension’ involved there. So what’s the final answer? Well… The Planck units are not dimensionless. All we can say is that they are closely related, physically. I should also add that we’ll use the electron charge and mass (expressed in Planck units) in our amplitude calculations as a simple (dimensionless) number between zero and one. So the correct answer to the question as to whether these numbers have any dimension is: expressing some quantities in Planck units sort of normalizes them, so we can use them directly in dimensionless calculations, like when we multiply and add amplitudes. Hmm… Well… I can imagine you’re not very happy with this answer but it’s the best I can do. Sorry. I’ll let you further ponder that question. I need to move on. Note that that 4.181×10−23 is still a very small number (23 zeroes after the decimal point! ), even if it’s like 46 million times larger than the electron mass measured in our conventional SI unit (i.e. 9.1×10–31 kg). Does such small number make any sense? The answer is: yes, it does. When we’ll finally start discussing that E(A to B) formula (I’ll give it to you in a moment), you’ll see that a very small number for n makes a lot of sense. Before diving into it all, let’s first see if that formula for that alpha, that fine-structure constant, still makes sense with me expressed in Planck units. Just to make sure. 🙂 To do that, we need to use the fifth (last) expression for a, i.e. the one with re in it. Now, in my previous post, I also gave some formula for re: re = e2/4πε0mec2, which we can re-write as reme = e2/4πε0c2. If we substitute that expression for reme in the formula for α, we can calculate α from the electron charge, which indicates both the electron radius and its mass are not some random God-given variable, or “some magic number that comes to us with no understanding by man“, as Feynman – well… Leighton, I guess – puts it. No. They are magic numbers alright, one related to another through the equally ‘magic’ number α, but so I do feel we actually can create some understanding here. IT IS ALL IN ALPHA! 2. From our discussions on energy, we know that the kinetic energy is mv2/2, which we can write as p2/2m so we get rid of the velocity factor. [Why? Because we can’t really imagine what it is anyway. As I said a couple of times already, we shouldn’t think of electrons as planets orbiting around some star. That model doesn’t work.] So… What’s next? Well… Substituting our p ≈ ħ/r conjecture, we get K.E. = ħ2/2mr2. So that’s a formula for the kinetic energy. Next is potential. 3. Unfortunately, the discussion on potential energy is a bit more complicated. You’ll probably remember that we had an easy and very comprehensible formula for the energy that’s needed (i.e. the work that needs to be done) to bring two charges together from a large distance (i.e. infinity). Indeed, we derived that formula directly from Coulomb’s Law (and Newton’s law of force) and it’s U = q1q2/4πε0r12. [If you think I am going too fast, sorry, please check for yourself by reading my other posts.] Now, we’re actually talking about the size of an atom here in my previous post, so one charge is the proton (+e) and the other is the electron (–e), so the potential energy is U = P.E. = –e2/4πε0r, with r the ‘distance’ between the proton and the electron—so that’s the Bohr radius we’re looking for! So what? Well… Double-check it on the Internet: the Bohr radius is, effectively, about 53 trillionths of a meter indeed! So we’re right on the spot! Moreover, if we take that value for r and put it in the (total) energy formula above, we’d find that the energy of the electron is –13.6 eV. [Don’t forget to convert from joule to electronvolt when doing the calculation!] Now you can check that on the Internet too: 13.6 eV is exactly the amount of energy that’s needed to ionize a hydrogen atom (i.e. the energy that’s needed to kick the electron out of that energy well)! So… Well… Doesn’t that confirm we actually do have it all with α? It’s not like God gave us one number only (α) and that all the rest flows out of it. We have a whole bunch of ‘fundamental’ relations and ‘fundamental’ constants here. Having said that, it’s true that statement still does not diminish the magic of alpha. Hmm… Now you’ll wonder: how many? How many constants do we need in all of physics? Hey! Wait a minute! How do we know that ke = 1/4πε0? Well… From experiment. But… Yes? That means 1/4π is some fundamental proportionality coefficient too, isn’t it? Wow! You’re smart. That’s a good and valid remark. In fact, we use the so-called reduced Planck constant ħ in a number of calculations, and so that involves a 2π factor too (ħ = h/2π). Hence… Well… Yes, perhaps we should consider 2π as some fundamental constant too! And, then, well… Now that I think of it, there’s a few other mathematical constants out there, like Euler’s number e, for example, which we use in complex exponentials. Well… Yes and no. They’re mathematical constants indeed, rather than physical, but… Well… I hope you get my point. What I want to show here, is that it’s quite hard to say what’s fundamental and what isn’t. We can actually pick and choose a bit among all those constants and all those equations. As one physicist puts its: it depends on how we slice it. The one thing we know for sure is that a great many things are related, in a physical way (α connects all of the fundamental properties of the electron, for example) and/or in a mathematical way (2π connects not only the circumference of the unit circle with the radius but quite a few other constants as well! ), but… Well… What to say? It’s a tough discussion and I am not smart enough to give you an unambiguous answer. From what I gather on the Internet, when looking at the whole Standard Model (including the strong force, the weak force and the Higgs field), we’ve got a few dozen physical ‘fundamental’ constants, and then a few mathematical ones as well. Indeed, I must assume that, with all these digressions, you are truly despairing now. Don’t. We’re there! We’re finally ready for the E(A to B) formula! Let’s go for it. 1. The value of e is approximately –0.08542455, and it corresponds to the so-called junction number j, which is the amplitude for an electron-photon coupling. When multiplying it with another amplitude (to find the amplitude for an event consisting of two sub-events, for example), it corresponds to a ‘shrink’ to less than one-tenth (something like 8.5% indeed, corresponding to the magnitude of e) and a ‘rotation’ (or a ‘turn’) over 180 degrees, as mentioned above. Please note what’s going on here: we have a physical quantity, the electron charge (expressed in Planck units), and we use it in a quantum-mechanical calculation as a dimensionless (complex) number, i.e. as an amplitude. So… Well… That’s what physicists mean when they say that the charge of some particle (usually the electric charge but, in quantum chromodynamics, it will be the ‘color’ charge of a quark) is a ‘coupling constant’. 2. We also have m, the electron mass, and we’ll use in the same way, i.e. as some dimensionless amplitude. As compared to j, it’s is a very tiny number: approximately 4.181×10−23. So if you look at it as an amplitude, indeed, then it corresponds to an enormous ‘shrink’ (but no turn) of the amplitude(s) that we’ll be combining it with. So… Well… How do we do it? Well… At this point, Leighton goes a bit off-track. Just a little bit. 🙂 From what he writes, it’s obvious that he assumes the frequency (or, what amounts to the same, the de Broglie wavelength) of an electron is just like the frequency of a photon. Frankly, I just can’t imagine why and how Feynman let this happen. It’s wrong. Plain wrong. As I mentioned in my introduction already, an electron traveling through space is not like a photon traveling through space. For starters, an electron is much slower (because it’s a matter-particle: hence, it’s got mass). Secondly, the de Broglie wavelength and/or frequency of an electron is not like that of a photon. For example, if we take an electron and a photon having the same energy, let’s say 1 eV (that corresponds to infrared light), then the de Broglie wavelength of the electron will be 1.23 nano-meter (i.e. 1.23 billionths of a meter). Now that’s about one thousand times smaller than the wavelength of our 1 eV photon, which is about 1240 nm. You’ll say: how is that possible? If they have the same energy, then the f = E/h and ν = E/h should give the same frequency and, hence, the same wavelength, no? Well… No! Not at all! Because an electron, unlike the photon, has a rest mass indeed – measured as not less than 0.511 MeV/c2, to be precise (note the rather particular MeV/c2 unit: it’s from the E = mc2 formula) – one should use a different energy value! Indeed, we should include the rest mass energy, which is 0.511 MeV. So, almost all of the energy here is rest mass energy! There’s also another complication. For the photon, there is an easy relationship between the wavelength and the frequency: it has no mass and, hence, all its energy is kinetic, or movement so to say, and so we can use that ν = E/h relationship to calculate its frequency ν: it’s equal to ν = E/h = (1 eV)/(4.13567×10–15 eV·s) ≈ 0.242×1015 Hz = 242 tera-hertz (1 THz = 1012 oscillations per second). Now, knowing that light travels at the speed of light, we can check the result by calculating the wavelength using the λ = c/ν relation. Let’s do it: (2.998×108 m/s)/(242×1012 Hz) ≈ 1240 nm. So… Yes, done! To be precise, the phase velocity will be superluminal. Indeed, using the usual relativistic formula, we can write that p = γm0v and E = γm0c2, with v the (classical) velocity of the electron and c what it always is, i.e. the speed of light. Hence, λ = h/γm0v and f = γm0c2/h, and so λf = c2/v. Because v is (much) smaller than c, we get a superluminal velocity. However, that’s the phase velocity indeed, not the group velocity, which corresponds to v. OK… I need to end this digression. So what? Well, to make a long story short, the ‘amplitude framework’ for electrons is differerent. Hence, the story that I’ll be telling here is different from what you’ll read in Feynman’s QED. I will use his drawings, though, and his concepts. Indeed, despite my misgivings above, the conceptual framework is sound, and so the corrections to be made are relatively minor. So… We’re looking at E(A to B), i.e. the amplitude for an electron to go from point A to B in spacetime, and I said the conceptual framework is exactly the same as that for a photon. Hence, the electron can follow any path really. It may go in a straight line and travel at a speed that’s consistent with what we know of its momentum (p), but it may also follow other paths. So, just like the photon, we’ll have some so-called propagator function, which gives you amplitudes based on the distance in space as well as in the distance in ‘time’ between two points. Now, Ralph Leighton identifies that propagator function with the propagator function for the photon, i.e. P(A to B), but that’s wrong: it’s not the same. The propagator function for an electron depends on its mass and its velocity, and/or on the combination of both (like it momentum p = mv and/or its kinetic energy: K.E. = mv2 = p2/2m). So we have a different propagator function here. However, I’ll use the same symbol for it: P(A to B). So, the bottom line is that, because of the electron’s mass (which, remember, is a measure for inertia), momentum and/or kinetic energy (which, remember, are conserved in physics), the straight line is definitely the most likely path, but (big but! ), just like the photon, the electron may follow some other path as well. So how do we formalize that? Let’s first associate an amplitude P(A to B) with an electron traveling from point A to B in a straight line and in a time that’s consistent with its velocity. Now, as mentioned above, the P here stands for propagator function, not for photon, so we’re talking a different P(A to B) here than that P(A to B) function we used for the photon. Sorry for the confusion. 🙂 The left-hand diagram below then shows what we’re talking about: it’s the so-called ‘one-hop flight’, and so that’s what the P(A to B) amplitude is associated with. Now, the electron can follow other paths. For photons, we said the amplitude depended on the spacetime interval I: when negative or positive (i.e. paths that are not associated with the photon traveling in a straight line and/or at the speed of light), the contribution of those paths to the final amplitudes (or ‘final arrow’, as it was called) was smaller. Note what’s going on here. We multiply two amplitudes, P(A to C) and P(C to B), which is OK, because that’s what the rules of quantum mechanics tell us: if an ‘event’ consists of two sub-events, we need to multiply the amplitudes (not the probabilities) in order to get the amplitude that’s associated with both sub-events happening. However, we add an extra factor: n2. Note that it must be some very small number because we have lots of alternative paths and, hence, they should not be very likely! So what’s the n? And why n2 instead of just n? Well… Frankly, I don’t know. Ralph Leighton boldly equates n to the mass of the electron. Now, because he obviously means the mass expressed in Planck units, that’s the same as saying n is the electron’s energy (again, expressed in Planck’s ‘natural’ units), so n should be that number m = meP = EeP = 4.181×10−23. However, I couldn’t find any confirmation on the Internet, or elsewhere, of the suggested n = m identity, so I’ll assume n = m indeed, but… Well… Please check for yourself. It seems the answer is to be found in a mathematical theory that helps physicists to actually calculate j and n from experiment. It’s referred to as perturbation theory, and it’s the next thing on my study list. As for now, however, I can’t help you much. I can only note that the equation makes sense. Of course, it does: inserting a tiny little number n, close to zero, ensures that those other amplitudes don’t contribute too much to the final ‘arrow’. And it also makes a lot of sense to associate it with the electron’s mass: if mass is a measure of inertia, then it should be some factor reducing the amplitude that’s associated with the electron following such crooked path. So let’s go along with it, and see what comes out of it. So we have an (n2)2 = n4 factor here, which is good, because two hops should be much less likely than one hop. So what do we get? Well… (4.181×10−23)4 ≈ 305×10−92. Pretty tiny, huh? 🙂 Of course, any point in space is a potential hop for the electron’s flight from point A to B and, hence, there’s a lot of paths and a lot of amplitudes (or ‘arrows’ if you want), which, again, is consistent with a very tiny value for n indeed. So, to make a long story short, E(A to B) will be a giant sum (i.e. some kind of integral indeed) of a lot of different ways an electron can go from point A to B. It will be a series of terms P(A to E) + P(A to C)∗n2∗P(C to B) + P(A to E)∗n2∗P(E to D)∗n2∗P(D to B) + … for all possible intermediate points C, D, E, and so on. What about the j? The junction number of coupling constant. How does that show up in the E(A to B) formula? Well… Those alternative paths with hops here and there are actually the easiest bit of the whole calculation. Apart from taking some strange path, electrons can also emit and/or absorb photons during the trip. In fact, they’re doing that constantly actually. Indeed, the image of an electron ‘in orbit’ around the nucleus is that of an electron exchanging so-called ‘virtual’ photons constantly, as illustrated below. So our image of an electron absorbing and then emitting a photon (see the diagram on the right-hand side) is really like the tiny tip of a giant iceberg: most of what’s going on is underneath! So that’s where our junction number j comes in, i.e. the charge (e) of the electron. So, when you hear that a coupling constant is actually equal to the charge, then this is what it means: you should just note it’s the charge expressed in Planck units. But it’s a deep connection, isn’t? When everything is said and done, a charge is something physical, but so here, in these amplitude calculations, it just shows up as some dimensionless negative number, used in multiplications and additions of amplitudes. Isn’t that remarkable? The situation becomes even more complicated when more than one electron is involved. For example, two electrons can go in a straight line from point 1 and 2 to point 3 and 4 respectively, but there’s two ways in which this can happen, and they might exchange photons along the way, as shown below. If there’s two alternative ways in which one event can happen, you know we have to add amplitudes, rather than multiply them. Hence, the formula for E(A to B) becomes even more complicated. Moreover, a single electron may first emit and then absorb a photon itself, so there’s no need for other particles to be there to have lots of j factors in our calculation. In addition, that photon may briefly disintegrate into an electron and a positron, which then annihilate each other to again produce a photon: in case you wondered, that’s what those little loops in those diagrams depicting the exchange of virtual photons is supposed to represent. So, every single junction (i.e. every emission and/or absorption of a photon) involves a multiplication with that junction number j, so if there are two couplings involved, we have a j2 factor, and so that’s 0.085424552 = α ≈ 0.0073. Four couplings implies a factor of 0.085424554 ≈ 0.000053. Just as an example, I copy two diagrams involving four, five or six couplings indeed. They all have some ‘incoming’ photon, because Feynman uses them to explain something else (the so-called magnetic moment of a photon), but it doesn’t matter: the same illustrations can serve multiple purposes. Now, it’s obvious that the contributions of the alternatives with many couplings add almost nothing to the final amplitude – just like the ‘many-hop’ flights add almost nothing – but… Well… As tiny as these contributions are, they are all there, and so they all have to be accounted for. So… Yes. You can easily appreciate how messy it all gets, especially in light of the fact that there are so many points that can serve as a ‘hop’ or a ‘coupling’ point! Now that raises a lot of questions, and very sensible ones, because that simplification is nonsensical. Not enough arrows? That statement doesn’t make sense. We can subdivide space in as many paths as we want, and probability amplitudes don’t take up any physical space. We can cut up space in smaller and smaller pieces (so we analyze more paths within the same space). The consequence – in terms of arrows – is that directions of our arrows won’t change but their length will be much and much smaller as we’re analyzing many more paths. That’s because of the normalization constraint. However, when adding them all up – a lot of very tiny ones, or a smaller bunch of bigger ones – we’ll still get the same ‘final’ arrow. That’s because the direction of those arrows depends on the length of the path, and the length of the path doesn’t change simply because we suddenly decide to use some other ‘gauge’. Much stuff is physics is quite ‘magical’, but it’s never ‘too magical’. I mean: there’s always an explanation. So there is a very logical explanation for the above-mentioned deep connection between the charge of an electron, its energy and/or mass, its various radii (or physical dimensions) and the coupling constant too. I wrote a piece about that, much later than when I wrote the piece above. I would recommend you read that piece too. It’s a piece in which I do take the magic out of ‘God’s number’. Understanding it involves a deep understanding of electromagnetism, however, and that requires some effort. It’s surely worth the effort, though. This entry was posted in Mathematics, Physics and tagged A Brief History of Time, Alix Mautner, coupling constant, Elaine Mason, fine-structure constant, gauge, gauge parameter, gauge theory, God's number, Jane Wilde, junction number, Leonard Mautner, Planck charge, Planck mass, popular books on physics, QED, quantum mechanics, Ralph Leighton, Richard Feynman, Richard Hawking, Taking the magic out of God's number, The Strange Theory of Light and Matter, The Theory of Everything. Bookmark the permalink. Man – loved your post – and you have to check out http://www.einsteinsintuition.com!! Thad Roberts wrote a book called „Einstein’s Intuition“ where he develops his Quantized Space Theory – QST. He found a new constant that is related to Pi. He called it „Je“ – and the value of „Je“ is: 0.0854245(43135). Where Pi is the limit of the ratio of a circle’s circumference to its diameter without curvature of space – „Je“ is the limit of that same ratio measured over maximum curved space (black hole). His only two axioms are: Space is quantized & the vacuum behaves like a superfluid. The mathematical background of QST is Bohmian Mechanics. The wrongfully forgotten deterministic version of quantum mechanics. => and you’ll be able to think in 11 dimensions intuitively. Promised! Extremely interesting. This week I won’t have time to look at it in detail – I am currently helping my daughter to prepare for her statistics exam – but I will surely get back to you next week.